This cozy recipe comes from Alexandra at A Taste of Well Being. Slow cooking the beef yields melt-in-your-mouth deliciousness. The recipe calls for 2 cups of Bonterra Cabernet – so plenty left over for you and your dining companions to enjoy with the finished meal! In a large pot or Dutch oven heat the olive oil over high heat. Season the beef well with salt and pepper. Once the pot is hot sear both side of the meat, about 4-5 minutes on each side until a nice seared crust is formed. Once you have seared the beef place it aside on a plate while you prepare the sauce. Lower the heat of the stove to low/medium and add the butter. When the butter has melted add the onions, carrots, and celery. Sprinkle the vegetables with salt and let them cook for 2-3 minutes. Then add the garlic and once the garlic is fragrant add the red wine and water. Season well with salt and pepper. Add the beef back to the pot and now add the rosemary and thyme sprigs. Bring this to a simmer and cover the pot. Lower the heat to low and let this cook for 2.5-3 hours on low. Once the beef has been braised remove it from the pot. Remember the longer and lower you cook the meat the more tender and fall off the bone affect it will have. Once the meat has been removed from the sauce turn the heat of the stove up to high and bring it to a boil. Once boiling reduce the red wine sauce to half. After about 6-7 minutes of reduction turn the heat off. Let it sit uncovered while you prepare the rest of the meal. Pull the tender braised beef apart and let it cool slightly. To make the polenta, bring the water to a boil in a sauce pan. Once boiling add the polenta in a nice even stream while stirring vigorously, stir for 1 minute. Turn the heat off once the polenta comes together and stir in the mascarpone, parmesan cheese, and salt and pepper. 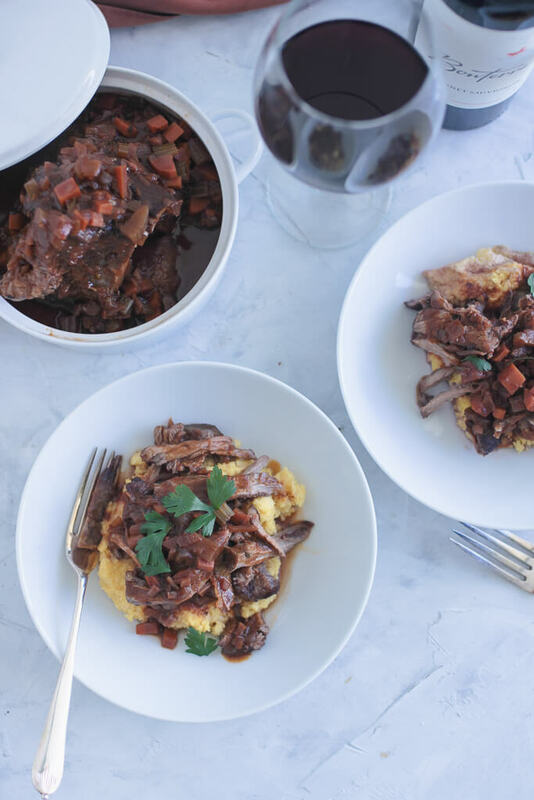 Serve the polenta first topped with the braised beef and garnished with a few spoonfuls of the red wine sauce and a glass of Bonterra Cabernet!